The Ute Indian Museum features one of the world’s most extensive collections of artifacts from the Utes, including moccasins and other clothing, headdresses and other ceremonial gear, cradleboards, flutes, water jars, and blankets. The Utes were a tribe of hunter-gatherers who roamed the Western Slope starting around 1000 A.D. but gradually gave way to white settlers in a series of treaties in the 1800s. Exhibits cover the history of the Utes, or Nunchu, from ancient times to the present. There were seven bands of Utes, including the Tabeguache or Uncompahgre who spent their winters in the Montrose-Grand Junction and summers in Ouray and Telluride. The museum was built in 1956 on the nine-acre homestead first settled by Chief Ouray and his wife, Chipeta, in the 1860s. By 1875, the couple was living in a six-room adobe house a quarter-mile north of the museum site, running a 500-acre farm, and riding in a carriage that had been a gift from Colorado Gov. Edward McCook. The museum’s grounds include a memorial for Ouray, who was originally buried near Ignacio but was reinterred here in 1925, and the crypt where Chipeta was buried after her death on reservation lands in Utah in 1924. 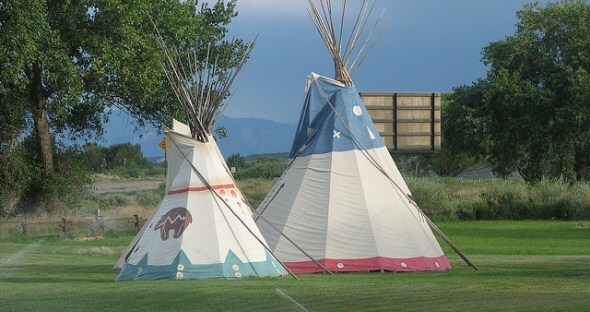 There also are canvas tepees. Ouray was the chief of the Utes from 1868 until his death in 1880 and sought to maintain peace with the federal government through a series of treaties in which the tribe gave up nearly all of the Western Slope to white settlers. President Hayes called Ouray “the most intellectual man I’ve ever conversed with” after the chief’s 1880 visit to Washington, D.C. Some members of the tribe, however, considered Ouray a coward and called him “White Man’s Friend.” Ouray married Chipeta, who was 10 years younger, in 1859, after his first wife died. After Ouray’s death, Chipeta continued his peacekeeping efforts, though she and other Utes were nearly lynched in 1880 by a mob in Alamosa angry over the 1879 Meeker Massacre, in which a band of Utes had killed 10 employees of the White River Indian Agency as tensions between the Utes and white settlers escalated. The museum was expanded in 1998 to add a visitor information center, gallery space, classrooms, and a museum store. The complex also has picnic areas, walking paths, and a memorial to the Spanish Dominguez-Escalante Expedition that passed through the Montrose area in 1776 and was responsible for naming many of the landmarks in southwestern Colorado. Behind the museum is a link to a walking trail that is a part of a citywide trail system.